Grace Community Church, based in Pensnett, is a passionate congregation of people, committed to making their local area a better place to live by responding to the changing needs of the community around them. As a community, they have pulled together using their individual skills and connections to build a vibrant new community space that will become a place where local people can come together, learn new things, and get support. 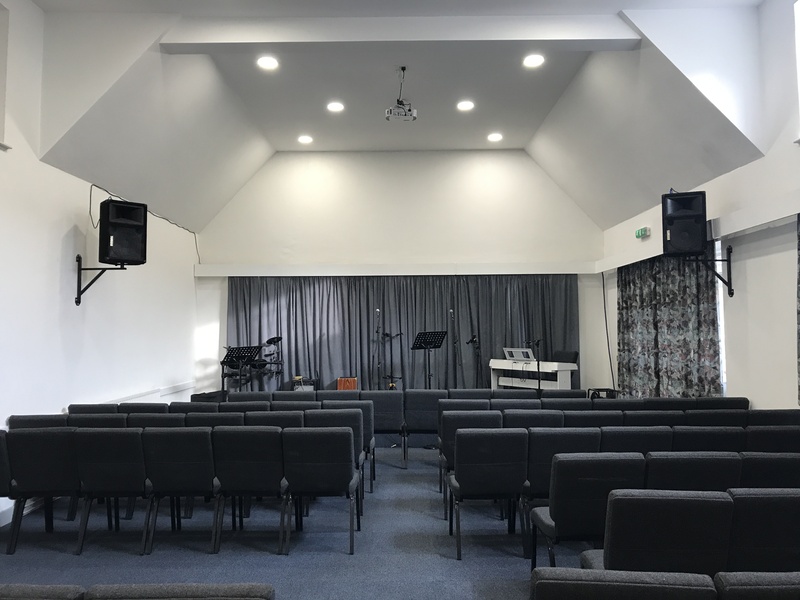 I recently visited Nigel Rowe, Pastor at Grace Community Church, at their new community building to find out more about their recent asset transfer success and future plans for the building and the local community. 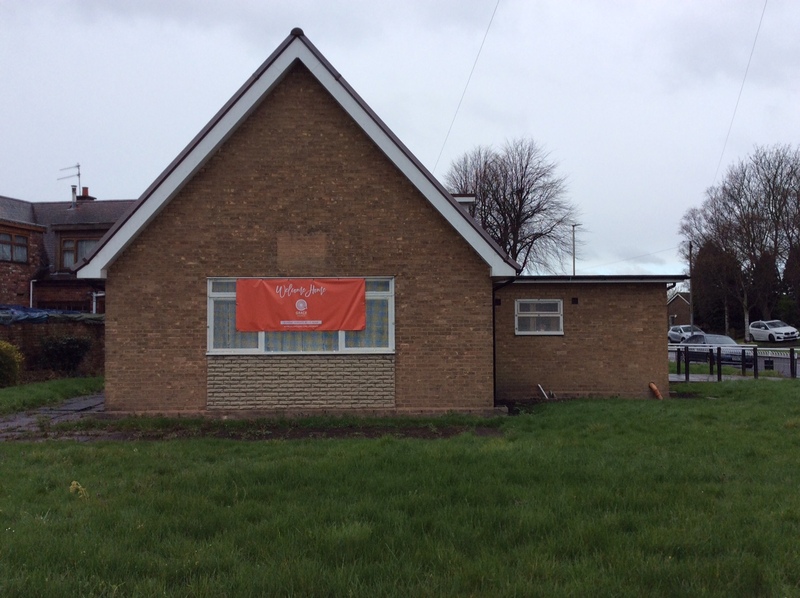 It was in early 2018 when Nigel approached Dudley CVS looking for a community space in the Pensnett area to use as a base for their group’s activities. After an initial discussion about potential buildings they could rent in the area, Becky, Dudley CVS Small Groups Officer, suggested community asset transfer as an option to consider and pointed in the direction of Dudley Council to find out more about potential buildings available in the area. After a short period of looking around, Nigel found a local building that wasn’t being fully utilized. It had previously been used for a senior citizens club, which only met once or twice a week for bingo. The space had the potential to offer lots more. After expressing an interest in the building, they put together a business plan and worked with Dudley Council to start the asset transfer process. They received the keys in October last year. Community asset transfer involves the transfer of responsibility for buildings or land from the local authority to a voluntary or community organisation. It presents opportunities to ensure that facilities can continue to be available locally for social, community and public use. The process starts with an expression of interest, followed by a business plan to show community support for the transfer, the kinds of activities that would take place in the building that would benefit the community, and financial sustainability. Although they found the asset transfer a lengthy process, it gave them some extra time to raise the funds to renovate the building. Roughly £25,000 has been spent on the renovations so far. The Ibstock Enovert Trust, an environmental body that supports community and environmental projects, awarded £15,000 for the project, and the church’s congregation worked hard to raise the rest of the money. When I visited Nigel at the building, I was amazed to find wonderfully welcoming, bright and spacious rooms, beautifully decorated with modern fixtures and fittings, a vast improvement from the old photos I’d seen of the building. Although not entirely finished, it’s very nearly there, even as I arrived there was somebody busily painting away! Nigel told me about the incredible support from the local community, how everybody pulled together to make this project happen, not only the congregation but also local businesses that had donated fittings, materials and equipment. Tiles were donated by a local business doing a renovation job in the area. Electricians, Sunny Electrical, and local plumbing company Gill Mechanical Service offered their skills at a reduced rate. 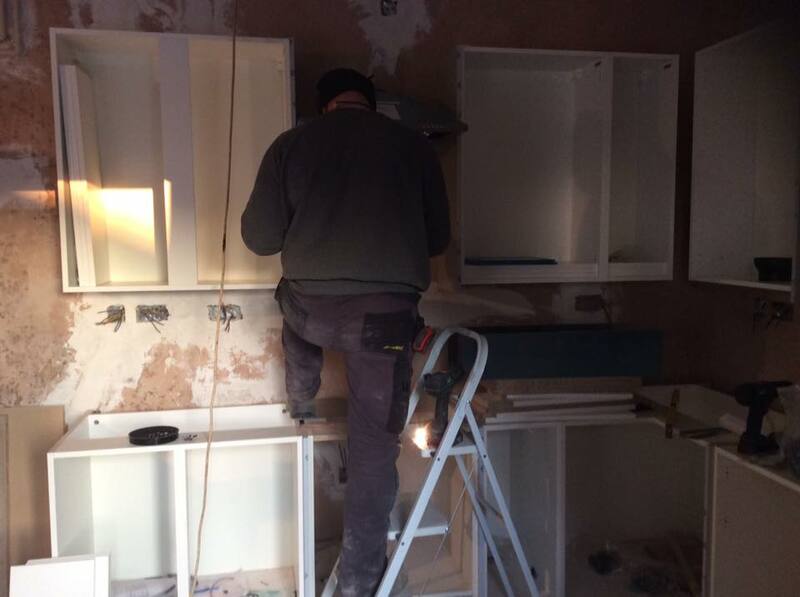 Will Hire from Lye hired out scaffolding and core drills free of charge. 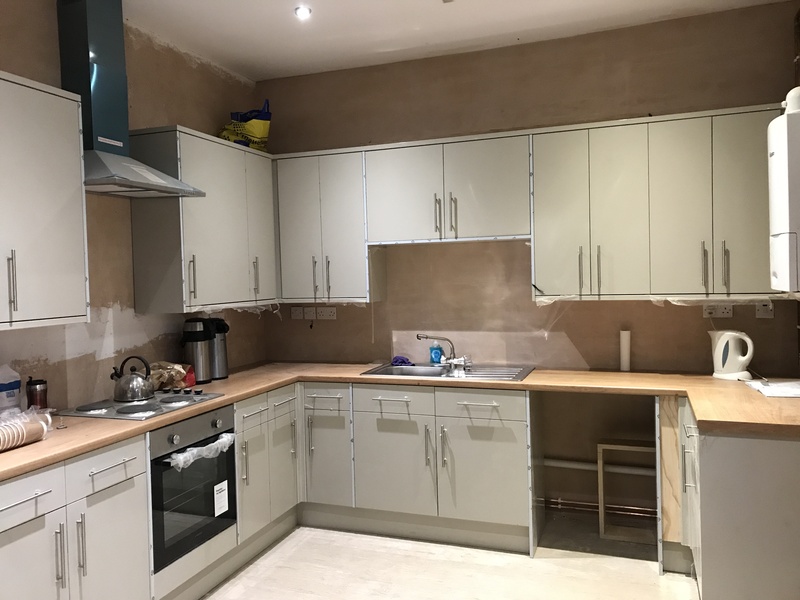 Howdens donated a fitted kitchen after hearing about their various food-related projects for local people, including hampers during the winter, and ‘Make Lunch’, providing free school meals to young people and children during the school holidays. And today, the incredible transformation – a bright and modern space! All Nations Church Wolverhampton, their parent church, has also helped and supported the work in the area. The building is now equipped with everything that is needed for a fully functioning community space. It has a large bright main room for events, a brand new modern kitchen space, toilet facilities and a day/activities room for toddler groups. The vision for what takes place in the building has been built around what they have learnt from the changing needs of the community around them. They will start with a toddler group to support isolated parents in the area, as since the closure of the local children’s centre there hasn’t been a great provision for parents. Their aim is to ensure that people can drop in at any time, and there will always be someone available in the building to support parents. Nigel added, “It will be a place where answers can be found. We don’t have all the answers, but we can work together to find them”. The Toddler Group meets every Tuesday morning from 9:30am until 11am. Nigel is also a Chaplain at Crestwood School, offering extra support for young people during lunchtime. This helps them to understand the needs of young people in the area. The space will be used to run activities with young families, to start youth groups, art clubs, coffee mornings, and in the future, they hope to put on parenting classes, and workshops to support people with managing their finances. There will be summer school meals in the new kitchen and big events during the summer and Christmas time. Currently, they run a music workshop on a Wednesday evening and are looking to expand. People of all ages are welcome to come and use the equipment. They also plan to link up with the local food bank and potentially use the building as a distribution point. Their aim is to build up better relationships with local people through running groups, classes and events. It’s also about connecting people socially by offering a safe place to meet to get to know other people, with a hope that new friendship groups will blossom. Nigel tells me, “Isolation affects people of all ages. There is nowhere local to just sit down and have a coffee. We want to have drop-ins so that people can come in and have a friendly face to share a hot drink and a cake with.” Exciting future plans include potentially opening a coffee shop in the building to provide people with a place to meet and do things, also giving local people job opportunities. Grace Community Church is now focused on getting over the starting line so they can bring exciting new projects and activities to the community. It’s wonderful to see such a transformation, providing the Pensnett community with a place to be for many years to come. I’m very much looking forward to seeing what comes next. Grace Toddler Group meets every Tuesday morning from 9:30am until 11am. There is also a meeting every Sunday morning from 10:30am for an open and friendly church service with children’s activities and refreshments at the end. All are welcome. Meet Paul and Alison. They’re the team behind the lovely Alzheimer’s and Friendship Group that meets at the Storehouse in Brierley Hill on most Monday evenings. It’s a place where people with Alzheimer’s and other types of dementia and their carers can come to meet others, share mutual support and make friends. I visited them recently to learn more about them and what the group means to the people that attend. As soon as I got to the door, I was greeted by Paul, who welcomed me into the Storehouse coffee shop which was laid out nicely so that everyone could see and talk to each other, or talk in smaller groups if they wanted to. I introduced myself to everyone and soon people started telling me their own stories about caring for someone with Alzheimer’s, which I think was a sign of how comfortable they felt in their surroundings. Paul and Alison clearly have time for everyone who walks through the door, helping them to feel welcome, wanted and comfortable. This is something that they’ve been doing for the past nine years; I was bowled over to learn that the group had been going for that long, just over the road from my office! Back in 2009, Paul, who has a background of working with people with dementia, met someone who couldn’t go out because of their caring role. In response to this, he and Alison, who worked with older people, thought about providing respite, a space for people with dementia while their carers got some time to themselves. They spoke to Albion Street Church, who agreed to let Paul and Alison use some space, first in the church itself and then in the Storehouse when it was refurbished. The Church also holds a small budget for the group which they can dip into for things like refreshments and entertainment, though they rarely use it and make sure it goes a long way! Over the years, the group has been flexible to the wishes of its participants. While some carers have brought their loved ones and taken advantage of the respite offered, other carers have stayed with their loved ones and participated in the activities. At the moment, the regular participants are all former carers, who continue to attend for the companionship they have gained over the years; none of the participants knew each other before they started attending the group. Some come from as far as Sedgley because of their shared experiences of caring for someone with Alzheimer’s. As we all shared our emotional experiences of loving and losing someone with Alzheimer’s, it did feel good to take some solace from people who had experienced it too. I can completely see how the Alzheimer’s and Friendship Groups helps people to feel less isolated. evidence suggests that the brain processes music differently to other functions, allowing people with dementia to enjoy songs and music long after other abilities are challenged. Rachel is connected to the Church herself and she gave her time and skills freely to entertain us for a couple of hours on a Monday night. This group really is a great example of how great things can happen with the right ingredients: people with a passion; a friendly venue and a supportive organisation behind them; good connections which can be mobilised for very little outlay. This is why I hadn’t heard of the group before: they have everything they need to succeed! Of course, this group is open to new members, whether they’re carers, cared-for, or both. So if you’re interested in making new friends in a supportive environment, the Alzheimer’s a Friendship Group meets on Monday evenings February-December (except bank holidays), 6pm onwards. So there’s room for groups like this and others to create supportive environments for carers and their loved ones. In fact, in Coseley residents have been coming together to develop a Dementia Friendly Cinema to help people with dementia to stay connected in their community. Using a wonderful guide from Alzheimer’s Society to make small adaptations to help people with dementia feel safe and supported, they’ve had one screening and are planning another soon. The next screening will be Some Like It Hot on Tuesday 16 October, at 2pm. To register for this, please visit the Coseley Community Cinema page. If you’d like to get more involved with either the Alzheimer’s and Friendship Group or the Coseley Dementia Cinema, then please feel free to get in touch and I’ll link you with them. You’d be forgiven for not associating landlocked Dudley with watersports! But did you know there are lots of opportunities to get on (and in!) the water without venturing too far from home? There’s the canal network, where Stourbridge Arm Canoe Club paddle; there’s the lake at Himley Hall that I once fell in after an argument with an uncooperative kayak, and which is home to Himley Hall Sailing Club; there’s all sorts going on at Dudley Watersports Centre based at Lodge Farm Reservoir in Netherton, including waterskiing and wakeboarding, sailing, scuba diving and open water swimming! One of the newest additions to Dudley Watersports Centre is Dudley Rowing Club, a friendly group that wants to pass its love of rowing to anyone and everyone. I met with them recently to find out more about them, discuss their plans and help them to find some funders that might support what they’re trying to achieve. It’s always a pleasure to visit Dudley Watersports Centre, a real haven in the middle of a built up area! Dudley Rowing Club is a community amateur sports club (CASC), which means it is (and always will be) set up help anyone in the community to access rowing, whatever their ability or circumstance. The people there certainly embrace that concept. Rowing is often seen as a sport for better off people because it requires a stretch of water, a boat and someone to teach how to do it; there are obvious risks if it is not done properly and it takes time to reach a safe level. The club is working hard to make rowing accessible, allowing people to pay by instalments and running a row as you go rate of £5 per session. Dudley Rowing Club also offers rowing to a school for learning disabled children, a homelessness project, a charity for people with head injuries and a mentoring service for 18-30 year-olds who have a range of needs. The club works with the charity Access in Dudley too, getting disabled people onto the water. Increasing people confidence: some people start off quite nervous of the water but the majority soon find that any misgivings are offset by their sense of achievement. Debbie is a young person who presents as very nervous and low in confidence, she frequently seeks confirmation that she is doing things correctly and seems genuinely surprised and delighted when she is told that she is. Debbie responds well to positive criticism, she says that she loves rowing and has progressed from being very anxious about being in the stable four that we have, to now rowing on her own in a stable boat, she enjoys helping other members of her group if they get into any difficulties (getting stuck in surrounding bushes is a frequent problem for beginners) and the leaders of her project report that they have seen a significant improvement in Debbie’s confidence. Liam is a very quiet young man, he does not initiate conversations with anyone other than his closest friend in the group; when spoken to Liam will give as short an answer as possible. He is friendly, likes to be spoken to, but is noticeably uncomfortable if a response is sought; we are sensitive to this when speaking with him. Liam was slow to pick up the skills required for rowing in the four, possibly because he could not ask for help or clarification. We have worked patiently with Liam to the point where he is now rowing well in a single and his technique is amongst the best in his group. The biggest thing the club is looking for at the moment is the £15,000 to buy a ‘quad’, a boat its junior members can use, as they currently have to practise at a nearby club using its equipment. Dudley Rowing Club would dearly love to bring its junior members back to Netherton as soon as possible. Dudley Rowing Club can work with more schools and organisations to make rowing accessible to many more children and adults experiencing disadvantage. Dudley Rowing Club will be able to engage Schools to take up rowing lessons and from this attract some of the pupils to join, helping the club to become more sustainable in the future. If you would like to learn more about Dudley Rowing Club, join or help them, please visit the club’s Facebook page. You’ll be made really welcome. Thank you to Dudley Rowing Club’s Facebook page for allowing me to use their excellent pictures in this blog too! I’m looking forward to working with this club more. Shadowed by the beautifully refurbished Lye and Wollescote Chapels (now known as the Thomas Robinson Building) Lye and Wollescote Cemetery is a peaceful spot for reflection and an historically fascinating site. I visited recently and was overwhelmed by the transformation the Friends of Lye and Wollescote Cemetery have made to the site in the past two and a bit years since I saw them last! Lye and Wollescote Chapels is a rare example of two chapels – Church of England and Nonconformist – being housed in one building, and originally the cemetery was divided along those lines. The cemetery now has an area for Muslim burials, it houses the graves of 29 servicemen who lost their lives in the First and Second World Wars (managed by the Commonwealth War Graves Commission) and it’s the final resting place of local people of historical significance, from inventors to entrepreneurs. The Friends of Lye and Wollescote Cemetery are working hard to make sure people can still see these links to the past and to create a pleasant environment for visitors. The group came together during the renovation of the Grade II listed chapels led by West Midlands Historic Buildings Trust (WMHBT). As part of the £1.2m project, WMHBT wanted to engage with the community to increase the chances of the project’s long-term sustainability. Soon, a small group of volunteers was clearing the cemetery ground on the first Saturday of every month. Donna and I met the volunteers in 2016. We visited the cemetery, which was overgrown and pretty uninviting (I’m sure it didn’t help that it was a cold and dismal January morning!) and did a series of workshops in the nearby (and warm) Stambermill House where we built a vision for what the cemetery could be like in the future, painted a picture of the skills, talents and networks that each volunteer brought and created a simple plan. We also developed a simple constitution during our conversations about whether the volunteers would like to become a constituted group or to remain informal for the time being. Fast forward two years and the group has achieved so much! The Friends of Lye and Wollescote Cemetery signed their constitution and opened a bank account, which unlocked a grant of £5,000 from the Community Forums. They’ve also managed to raise a further £2,500! The visible difference the group has made to cemetery is clear. They’ve cleared grounds and uncovered graves that they didn’t know were there; they’ve cleaned graves meticulously; they’ve brought in professionals to repair graves; they’ve installed two beautiful benches commemorating those who died in the First and Second World Wars; they’ve set up a system to make it easier for people to carry water from the site’s only tap. All of this work has increased the number of visitors to the cemetery, whether for the local history, for remembrance or for the peaceful environment that’s open to everyone. The Friends have told me that more people now come to lay flowers at graves, many of which have no family members left to tend to them. The group’s Facebook group is very active too, and there are always lots of messages of thanks to the Friends from local people who walk through the grounds, as well as progress reports from the Friends themselves. It really feels like these volunteers have built a sense of community around this almost forgotten site. Coincidentally, when I paid a visit to the grounds I met Ian from Dudley Council’s Bereavement Services, which manages the cemetery. Ian was as enthusiastic about the group’s achievements as I am and he’d love it if every cemetery in the borough had a friends group, testament to how local people really do make local places. So what about the future? Members of the Friends of Lye and Wollescote Cemetery plan to continue their work. They want to repair more graves, which costs money; each grave that needs professional repair costs in the region of £400-£1,500. I’m in the process of identifying funders that may support this type of work and the group will do plenty of its own fundraising. Wish us luck! If you’d like to get involved with Friends of Lye and Wollescote Cemetery, you’ll find them on site on the first Saturday of every month from 9.30am. They meet on the third Wednesday of the month, 6.30pm at Stambermill House and you can always join the Facebook group. Dudley CVS is involved in a small piece of work with Age UK Dudley to help older people make connections in their communities that can combat loneliness, boost health and help people to be more resilient. We’d like to shout about the great work that is already happening at a small scale, local level in community groups across Dudley borough, celebrate what they’re doing and learn about how we can support more of this type of activity. For inspiration, you might like to read about what Netherton Regeneration Group is doing to build kindness and social connectedness in their community. If you get in touch, Helena and I will pay you a visit to help you to shout about the great things you’re up to and to offer you further support. So please, feel free to contact us using the comments section below, emailing smallgroups@dudleycvs.org.uk or calling Becky on 01384 573381.